Check out the new 20×9” silver BBS CH-R wheels on the B5 Blue Bomber. These are designed to work with the stock tires. Keep a close eye out for BBS and SpeedFactory’s announcement of this new product. The car was a blast to drive home. Gas mileage did increase to about 22-23 mpg. The ride was very comfortable – firm but no loose play or body roll. The updated suspension really do a lot for the car in terms of giving the driver a much better feel of the road and overall driving experience. The supercharger. Wow! I can feel the car fighting for traction all the time. I think I’ll have to replace those stock Goodyear Eagle F1′s in about 2 weeks! The power is great though. Very manageable once you learn how the supercharger works and how it’s power is developed. You truly just drive this car around town with no problem. I think I could let my grandma drive this car around town and she would be fine. The exhaust has a great sound. Under power with your foot to the floor or just cruising at 75mph. Actually at 75mph you can hardly hear it. I love the sound when you let off the gas and the transmission downshifts on its own. Here are a few build photos of our red Challenger research and development car. This car will be appearing in some upcoming media and events. 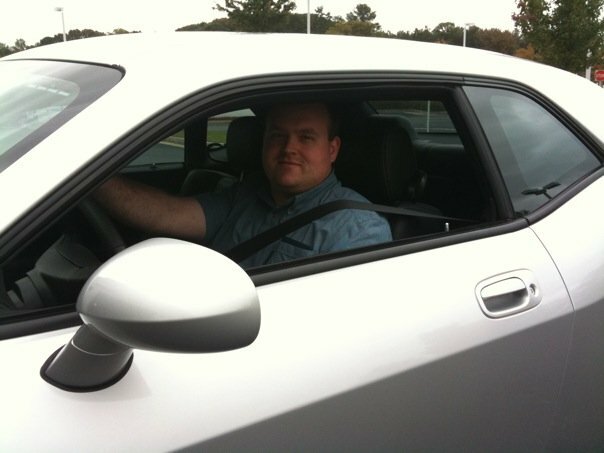 Doug's Supercharged Challenger – "that's what it's all about"